I am indeed a bubble wrap connoisseur. I love the stuff! 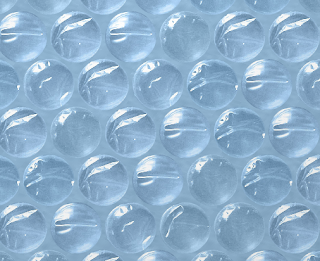 For a little fun, try this cool game online by clicking the square of bubble wrap below! Warning: you may waste a lot of time figuring out how to play songs on this thing. "Disclaimer: Virtual Bubble Wrap is a fun site with a flash game that lets you pop bubble wrap on your computer. This site is intended as humor and is not to be used to protect fragile items while transporting. We accept no responsibility for damage to your computer or belongings should you attempt to package your breakables with our virtual bubble wrap. Please enjoy our fun flash game which is a silly, strange, bizarre, weird, useless, funny, silly, mindless, time waster and stress reliever. " While this next link doesn't have the musical option of the first, it does give a tiny taste of the satisfying "YES!" you get from popping bubble wrap. 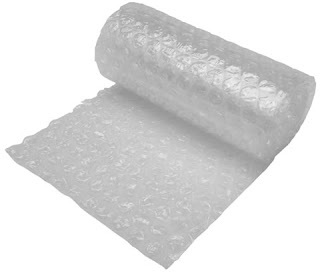 Click on the roll of bubble wrap for a fix of virtual bubble wrap bliss. 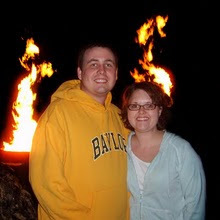 Well, it would appear that my "Burn Project" otherwise known as the DVD tour of the Waco campus and Boys Ranch is done. I receieved the copies of the DVD from the duplicating service. Today I passed out copies to the administrators and the Admissions office. Now I am tentatively checking off this project...in pencil. I'm still nervous I'll hear something back saying, "That picture is of a kid who can't be shown!" Give me a week and then I think I'll feel a little more confident. But the illusion of being done with the project is appealing, even if it is only an illusion! Aren't they pretty! Perhaps not, but they took about 6 months to produce! For Christmas, my favorite pre-born Hagey gave me a little can. On the can were instructions to water the contents and wait for a special message-bean to grow. Yes, grow. You see, I always call baby girl Hagey "the Bean," so it was only appropriate that she would buy me a message bean as her first Christmas gift! This is a picture of me with Theresa (the Bean's mom), and the Bean! Needless to say I was skeptical as to whether this "message" would appear (as was Theresa). However, I am proud to announce that the bean did appear with a little message of love. Here is a recent picture. The bean sprouted on December 30th and now it is HUGE! I have been working on this one particular project since I started at MCH. It is a DVD tour of the Waco campus and Boys Ranch. It is photos that have gradual zooms in and out...and it also has a voice over script that matches up with the photos. I thought the project would be done today as I received the final DVD from a video company here in Waco. But the video quality of the final product is significantly lower than the final product I produced. So I have resorted to trying different methods to burn the DVD myself. As I was working on one of those methods, my eye caught the task bar on my computer. It said, "Burn Project." Well, it is obviously not Christmas today, nor is it even New Year's Day! I have been meaning to get this up here for a while now so here goes. Here are some pictures and videos from our festivities. This cat food was a "present" from Mom and Dad to Oscar. It looked and smelled like vomit. Oscar agreed and wouldn't even taste it! It must have been pretty bad for a fat cat to say "No" to food! I know how to make my hubby happy - kiddie toys in his stocking! I LOVE THESE THINGS! :) When I was a kid, my uncle Jim got me some pills that turned into little sponge animals. I think I played with them in the bathtub until the sponges fell apart. Marc helped me relive my childhood memory with some African safari themed "growing pills." Here are a few funny videos from our Christmas Eve dinner with Mom and Dad...ahem...and Oscar. You may remember that last Christmas we let Oscar sit in a chair at the table because he wouldn't stop meowing until he could sit in a chair and see us. Well, we continued the tradition this year because, once again, Oscar was meowing up a storm. It is so weird. He won't eat our food, he just wants to sit by all of us! He did, however, want to play with the napkin ring. What can I say? Cats are dumb! Clearly Mom's parmigian chicken is superior to napkin rings!